John Mordaunt (?-1642) fifth baron of Beauchamp and Mordaunt was made Earl of Peterborough by Charles I on 9 March 1627/8. He nevertheless sided with parliament in the civil war, where he served as general of the ordnance. His sons were named Henry Mordaunt 2nd Earl of Peterborough and John . Henry Mordaunt (1621-1697) would become governor of Tangier in 1662, and rose to high influence by converting to Catholicism in 1687. In 1688 Henry tried to escape with James II, but was caught. He was imprisoned in the Tower, and charged with high treason, especialy because he was a renegade. In 1690 he was released on bail, only to come under new suspicion in 1696. He died on 19 June 1697. John Mordaunt (1627-1675) was involved in a plan for an insurrection against Cromwell. He was arrested in 1658, but got away because his wife bribed the judges. This and other services prompted the king to create him Baron of Reigate and Viscount of Avalon in 1659. John then started an actual insurrection on 10 July 1659, but failed and had to hide and flee. Upon the restoration he became Constable of Windsor Castle and Lord Lieutenant of Surrey. In conflict with his brother he succeeded in getting a part of the Manor of Reigate out of his mother's inheritance. Charles Mordaunt was born in 1658 to John Mordaunt and Elizabeth Carey. He was the eldest of a family of seven sons and four daughters. The first six sons all joined the military, the last joined the clergy. It is supposed that Charles received his early education at Eton. He Christ Church College of Oxford on 11 April 1674 aged 16. Charles'academic career was very short. In November 1674 Charles served as a volunteer on the Cambridge commanded by his mother's stepbrother Arthur Herbert. It would join a squadron that had been ordered to the Mediterranean under John Narborough in October 1674. The Cambridge returned in 1675, but Charles moved to Narborough's Henrietta. and would not return till 1677 1. On 5 June 1675 Charles became Viscount Mordaunt of Avalon on the death of his father at age 47. Charles probably did not know that right away, because the fleet only returned in 1677. So Charles was Viscount Mordaunt of Avalon at age 19. He was however not so rich as one might believe: on the death of his father the Reigate lands went to Earl Henry and later on his daughter Mary. His main possessions therefore consisted in what his mother had left him. Peterborough was therefore probably quite happy to get appointed to the sinecure of Keeper of the New Lodge in 1678. The young Viscount Mordaunt soon married to Carey, daughter of Sir Alexander Frasier of Durris, Kincardineshire. This did not impede him from embarking on the 'Bristol' in September 1678, a frigate destined for the Barbary Coast. From this expedition he returned after a year at sea2. In 1680 he was again a volunteer, this time in an expedition to relieve Tangier. He entered Tangier but left before the end of the year. At court Mordaunt was protected by his uncle Henry (at that moment still called Earl of Peterborough). It's also quite likely that Charles II liked Mordaunt's contempt for religion and morality. As a viscount Mordaunt was a member of the House of Lords and he made his first mark there in 1681 when he subscribed to a petition of 16 peers against the convocation of parliament at Oxford in 1681. On the death of Charles II James II ascended the throne and asked parliament for a large increase in the standing army and the appointment of Catholic officers. On this occasion Mordaunt addressed the house for the first time. In a brilliant and audacious speech he warned that the nation was facing an attempt to establish arbitrary power3. Early in 1686 Charles got permission to serve in a Dutch fleet bounded for the West Indies, but he did not leave on it. It seems that Mordaunt then started to travel back and forth between England and Holland and became involved in William's plans against James. It's said that Mordaunt asked Stadholder William III to invade England immediately, but that William rebuked this plan as 'too romantical to build on'. According to the later Bishop Burnet, who was Mary's chaplain, Mordaunt became: 'the one whom his Highness chiefly trusted, and by whose advice he governed his motions'. Whatever the particulars may be there can be little doubt that Mordaunt played a role in preparing the Glorious revolution. Mordaunt was present in William's fleet when it landed near Torbay on 5 November 1688. He immediately got a commission to raise a regiment of horse and orders to seize Exeter. On 8 November Mordaunt summoned the town and entered it. Mordaunt then continued into Dorsetshire and further north. All this gained Mordaunt a lot of favors when William became king. On 14 February 1689 he was admitted into the Privy Council and in March he became Lord of the Bedchamber. On 1 April he was appointed as colonel of an infantry regiment and he was also appointed as lieutenant-colonel of a City of London volunteer cavalry regiment. He was also made Lord-Lieutenant of Northamptonshire in April and Water-Bailiff of the Severn in August. The most significant of his appointments were that of First Commissioner of the Treasury on 8 April 1689 and the one that made him Earl of Monmouth on 9 April. One could thus be tempted to believe that Mordaunt became heavily involved in the financial affairs of the kingdom, but these were in fact taken care of by Godolphin, who could not be continued as official head of the treasury. Mordaunt's responsibilities were with the civil service which could hand out a lot of jobs. In this capacity he used his patronage to help John Locke and Isaac Newton. Already in March 1690 Mordaunt lost this job to Sir John Lowther, but he was compensated with a pension. When William went to Ireland on 11 June 1690 he asked Mordaunt to accompany him. Mordaunt refused, but was still appointed as one of the Council of Nine. Shortly before 11 June letters to Monsieur de Coutenay, a French agent in Antwerp, had been intercepted. These were written in lemon juice and could be read by heating them. They revealed the detail of the deliberations of the Privy Council and thus led to the conclusion that there must be a traitor in this council. After William left these continued to be intercepted. Somewhat later the English fleet was lacking in its duty to engage the French, and so Mordaunt offered to go to the fleet in order to press Admiral Torrington to fight. After a lot of hassling the queen ordered Mordaunt and Admiral Russell to go to the fleet in order to determine what was to be done. They traveled with Mordaunt's secretary Major Wildman, but before they arrived news of the defeat of Beachy Head (30 June 1690) arrived in Portsmouth. The queen did however notice that while they were away the letters to Antwerp had stopped. Mordaunt's enemies in the Privy Council therefore thought that Mordaunt had put up a scheme in order to mark some of them as traitors, and in this they were probably right4. MordauntMordaunt furthermore occupied himself with accusing a lot of people of being unfaithful to King William, but it's difficult to determine whether these accusations were fuelled by his own ambition or sincere anxiety for the throne. In January 1691 Mordaunt accompanied William III to Holland and in April he returned. In April and May 1692 he got a military command with orders to bolster the defense of the Channel Islands. After that he made some trips to the Low Countries and returned with the king in October. After that he was one of the 18 Lords who protested the 7 December 1692 rejection of a proposal to have the public administration be investigated by a joint committee of the two houses. This boiled down to an attack upon William's administration of military affairs and broke their confidential relation. At length William was so fed up with Mordaunt's behavior that he suspended him in his duties as Gentleman of the Bedchamber in February 1694. Mordaunt was furthermore barred from the Privy Council and induced to give his infantry regiment to his brother Henry Mordaunt. All this did not mean that Mordaunt took any action to be reconciled with the King. In January 1695 he supported a Tory motion for another investigation and a little later he supported actions against Danby. Meanwhile the court did try to appease him, but these attempts were not successful. In the end of 1696 Sir John Fenwick, a man deeply involved in an assassination plot against William, was caught. In return for a full confession he was offered his life. In this 'confession' he implied Whigs like Russell and Shrewsbury and moderate Tories like Marlborough and Godolphin, but shielded William's real enemies. The Whigs answered these lies with a bill of attainder which reached the Lords on 26 November 1696. When it was read there for the first time on 1 December Mordaunt saw his chance to unmask the 'false friends' of the king. He wanted Fenwick to repeat his accusations against the moderate Whigs and Tories, but Fenwick refused and the bill would finally carry on 11 January 1697. Seeing that that her husband could get killed Lady Fenwick induced her brother the Earl of Carlysle to reveal the part Mordaunt had played to the House of Lords. In this house the accused then allied with the radical Tories in order to destroy Mordaunt. Fenwick was interrogated again on 22 December and revealed that in the previous interrogations he had written directions for his behavior. These he claimed had been handed to him by his wife at Newgate. In turn she had gotten them from the Duchess of Norfolk, and the Duchess (only child of Henry of Mordaunt) from Mordaunt. In explaining the plot to Lady Fenwick Mordaunt and the Duchess had however been overheard by Mrs. Elizabeth Lawson, and she confirmed these reports as a witness. Mordaunt was next heard in defense of his actions. He delivered a lengthy speech which stressed the fact that he had not personally profited since the revolution and that the whole affair was a papist plot against him. Mordaunt had an interview with the king, but by then the rank and file of the parties could no longer be held back and Mordaunt was formally accused. In January 1697 an official investigation of the documents Fenwick had received was started. In the end the House of Lords judged that Mordaunt had had a share in making the papers Lady Fenwick had received and had uttered vehement words against the king in the affair. They therefore judged him to be sent to The Tower and to be stripped of his appointments. Mordaunt thus lost his important offices, but he did not have to stay in the Tower very long. He was released on 30 March. 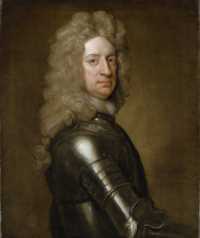 His uncle Henry died on 19 June 1697 and so Mordaunt, who had been called Earl of Monmouth was from then on referred to as the Earl of Peterborough5. It seems that all this induced Peterborough to keep quiet for a time, but from the spring of 1698 onwards he again appeared in the list of peers present in the Lord's debates. From then onward he seems to have associated himself with the moderate Tories like Marlborough and Godolphin and against the king and the Whigs. In the actions against John Somers on account of the Partition Treaties he ranged himself against the Whigs. While in disgrace Peterborough and his wife had made friends with Sarah Churchill and on the accession of Queen Anne this paid off. Peterborough was reappointed as Lord-Lieutenant of Northamptonshire. In October he was furthermore appointed as commander of an expedition to the West-Indies6 and as Governor and Captain-General of Jamaica. On 16 January 1703 Peterborough indeed received orders to depart with the fleet to the West Indies. On 25 January an Anglo-Dutch council in London did however cancel the expedition on grounds that it was already too late in the season7. February 1703 saw Peterborough as one of the leading figures in rejecting the Bill for the Preventing of Occasional Conformity. There was a lot of anticipation about whether Peterborough would get an important post, but on 31 March 1705 things became clear. On that day he was gazetted as general and commander in chief of the forces in the fleet. In April this was followed by an appointment as general and Commander in Chief of the allied forces in Spain8 and on 1 May he was made joint-admiral and Commander in Chief of the fleet. Late in May the fleet sailed to Spain and it arrived in Lisbon on 20 June 1705. The original goal of Peterborough's expedition was probably to take some action to relief the stress on Victor Amadeus of Savoy. On 11 July 1705 Landgrave George of Hessen-Darmstadt arrived there to, and on 12 July a Council of War was held. It decided to attack Barcelona and on 28 July Peterborough and Charles III sailed for Gibraltar. It left there on 5 August and sailed north to Valencia were it captured Denia. On 22 August the fleet arrived before Barcelona with about 7,000 men and it disembarked the troops somewhat east of the city on 23 August. These consisted of 17 battalions and 2 dragoon regiments, the garrison was estimated at 2,500 men9. The command then seriously started to think about the siege and soon concluded that their forces were not sufficient to attempt a siege. For this there were three reasons: the city was far too large, the garrison too strong and the help of the local population too small. Charles III did recognize the truth of these objections, but asked that some attempt should at least be made. Peterborough therefore went on shore to, but at first not much was achieved10. After some time the besiegers were despairing of success and on 8 September it was expected that on the next day one would start to embark the artillery. Peterborough and Hessen-Darmstadt then decided to make a final attempt. In the morning of 14 September they stormed Fort Montjuich and that assault succeeded against expectations. The Castle of Montjouich did however resist somewhat longer. On 17 September a powder-explosion then led to its surrender and so the siege made good progress, leading to the surrender of Barcelona on 9 October. The fall of Barcelona was followed by almost the whole of Catalonia opting for Charles III. In December the insurrection In Valencia then started to make great progress and was crowned with the capture of Valencia city. Felipe reacted by sending De Las Torres who started to blockade Valencia in January 1706. Peterborough then succeeded in lifting this blockade in February with less than 1,000 horse. In London the government was however not much pleased with Peterborough's conduct. A lot of officers did not want to serve under him and he was perceived as taking more initiatives than he could handle11. Peterborough furthermore quarreled with almost everyone present in Spain. Meanwhile a large French army had started to besiege Barcelona. A fleet under Admiral Leake was sent to lift the siege. Under his commission Peterborough took its command and arrived before Barcelona on 8 May 1706. After some last attempts the French then quit the siege on 11 May. Their retreat involved leaving the siege train and cost them a lot of soldiers because they were harassed by the Miquelets. On 11 June Peterborough was then appointed as ambassador to Charles III. Peterborough now wanted to advance to Madrid, but before he could do so Galway captured it on 27 June. In August Peterborough joined Galway's army near Madrid with King Charles III. In this camp there were 4 generals with a claim to the supreme command: De Las Minas as official commander of Galway's army; Noyelles as commander of Charles III's army; Galway as commander of the English army from Portugal and Peterborough. Peterborough therefore suggested that he might remove himself from the theater and on 9 August a council of ministers and generals was only to happy to approve his withdrawal. After making some arrangements in Valencia Peterborough left for Italy and arrived in Genoa in September. Here he heard that the siege of Turin had been lifted. He nevertheless met Victor Amadeus at Turin and Eugen in Pavia. Peterborough furthermore succeeded in loaning Lbp 100,000 in Genoa, pretending to be authorized by the government to do so. On 27 December he was back in Barcelona with the money. From Barcelona Peterborough reached Valencia on 10 January 1707. The allied army had meanwhile retreated into Valencia before Berwick's forces. On 4 January a Council of War was then held in which Peterborough strongly opposed another march on Madrid and pleaded for the defense of Aragon. In this he agreed with Charles III, Liechtenstein and Noyelles, but opposed Galway and Stanhope. In the end it decided first to take some measures to defend Valencia and then to march on Madrid from Aragon. Meanwhile the government was getting serious about removing him from the theater. Late in February a message arrived which appointed Galway as commander in chief of all British forces in Spain, thus annulling Peterborough's authority. For Peterborough this hint did not suffice and so on 14 March a message arrived which ordered him to London. Peterborough now left Spain. Peterborough first went to Italy and was in Turin in April. Here he had discussions with Victor Amadeus, but the English ambassador made sure that the Duke of Savoy understood that Peterborough's commissions were revoked and that he had been ordered back to England. On 30 April Peterborough left Turin and went for Vienna. Here he was received by the emperor and left in early July. He next went to Leipzig to see King Charles of Sweden. He later visited Electress Sophia in Hanover. Finally he arrived in Marlborough's headquarters at Soignies in August and outstayed his welcome there. On 20 August 1707 Peterborough finally arrived back in London. Harley was for starting formal procedures against Peterborough, but at first nothing was done. Peterborough meanwhile occupied himself by letting Freind write the 'Account of Peterborough's Conduct in Spain. On 15 December Lord Rochester then remarked in the Lords that he had been employed in important posts, but had been neither thanked nor censured. Peterborough replied that an investigation should then be started and this was commenced in January 1708. The investigation did not come to anything. Neither a motions of censure for fraud nor a motion to thank him were carried. In the controversy about his conduct Peterborough had been accused by the Godolphin ministery and defended by the Tories. At the 1710 change in government this paid off and Peterborough came in office again. On 2 November 1710 he was appointed as Captain General of the Marines. In December he was then nominated as ambassador extraordinary to Vienna. His departure was however delayed by a vigorous debate in the Lords about the war in Spain. This debate ended by applauding Peterborough and censuring Galway and the Godolphin ministery. On 10 February 1711 an address was presented to the queen expressing the admiration of the House for the many great and eminent services performed by the Earl of Peterborough. Peterborough then went to Vienna with instructions to smooth out the differences between the emperor and the Duke of Savoy. While in the theater emperor Joseph died and was to be replaced by Charles III. Peterborough then came up with a plan to make Victor Amadeus king of Spain, but his intentions were discovered. This made his position untenable and so he arrived back at Yarmouth on 23 June 1711. Under King George Peterborough was out of employment, but still considered eminent in society. There can be little doubt that Peterborough was very successful in creating for himself the public image of a brilliant general. Under his command the alliance achieved a lot of successes in Spain. On closer examination one however has to account for him not being the supreme commander of all forces in Spain. There is therefore no reason to ascribe the conquest of Valencia and the taking of Barcelona and the conquest of Catalonia to him in stead of ascribing them to local partisans of Charles III. The fact that there is a lot of documentary evidence of his quarrelsome nature made him unsuitable for supreme command on this ground alone. Next to that he probably did have some insight into military and a lot of talent for guerilla style operations, but the fact that London recalled him says enough about how his military abilities were appraised at the time. 1689 14 February Admitted into the Privy Council. 1702: October App. governor and Captain-General of Jamaica. 1702: October App. commander of aborted expedition to the west-indies. 1705: 31 March Gazetted as general and CiC of the forces in the fleet. 1705: 1 May Appointed as joint-admiral and CiC of the fleet. 1706: February Lifts the blockade of Valencia. 1706: 8 May arrives to Barcelona in a fleet to lift the siege. The prime reference for this page is: Peterborough by William Stebbing, Printed in London by Macmillan and Co. 1890. The Charles Mordaunt in the Dictionary of National Biography (DNB) is of course much shorter. It refers to Stebbing's Biography as being the best. 1) Stebbing differs from DNB by having that the expedition was against the Algerine pirates. 2) See page 8 of Stebbing. 3) See page 13 of Stebbing. 4) See page 23 of Stebbing. 5) It's very typical that at the time people's names could continually change because they got a noble title. I've here throughout referred to Charles Mordaunt as 'Peterborough' in order to make the page more comprehensible. 7) Letter by Van Vrijbergen to Heinsius on 26 January 1703. 9) Letter by Van Almonde to Heinsius on 26 August 1705. Van Almonde was then rather optimistic about allied chances. 10) Letter by Van Almonde to Heinsius on 8 September 1705.